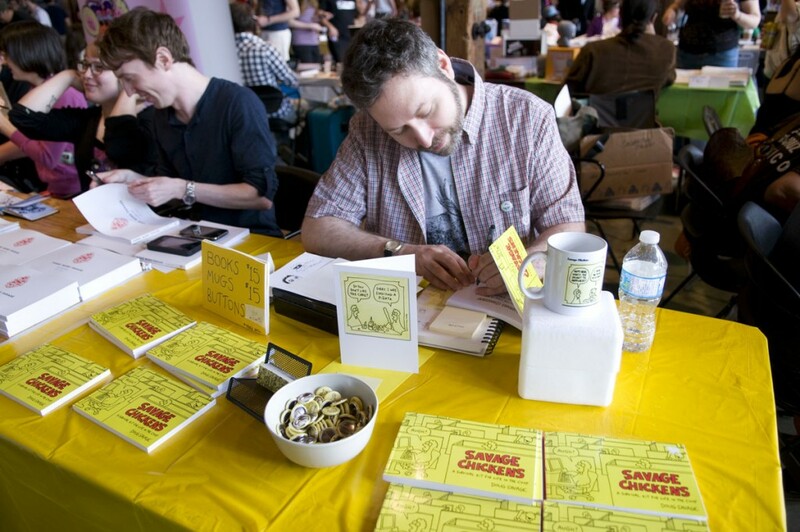 Q: Is it possible to make a living as a cartoonist? The main reason that I haven’t quit my day job yet is because I live in the lovely but ridiculous city of Vancouver, the most expensive place to live in Canada. My partner and I are planning to move to a smaller city where the cost of living is lower. Income from art is often unpredictable, but it can get a little more predictable if you cast out a wide net. I get a bit of income from advertising, a bit from product sales, a bit from royalties and licensing, and so on. The more ways you have to earn money from your work, the more it can settle down into a more predictable monthly income. There are also crowd-funding resources like KickStarter and Patreon, which I haven’t tried but I know have been very successful for some artists – especially those who have already established a good-sized readership. Stay on top of your social networking. You never know where opportunities will come from. My agent found out about me when she overheard a conversation at a cocktail party in San Francisco where somebody was talking about seeing a band and the lead singer told them to check out Savage Chickens. You can’t plan that sort of thing, but you can help make luck happen by putting yourself out there and interacting with others in your capacity as an artist. Instead of introducing yourself as an [insert day job] at parties, introduce yourself as an artist – you’ll have more interesting conversations, and more art-related opportunities will crop up. Supplement your art with something else. I know a bunch of artists who have struck a nice balance between their art and part-time jobs, especially teaching art at the college level. Think of your part-time job as being your own patron of the arts. When things don’t work out, don’t let it get you down. I’ve had a lot of cool things almost work out over the years. It can be discouraging, but you’ve gotta get up and dust yourself off and try again. If a project doesn’t work out, maybe you can sell the idea to somebody else, or turn the idea into something else. Don’t dwell on the stuff that doesn’t work out. Just get going on the next thing and hopefully it will work out! If you have any more questions about this, please add them to the comments here or send me a message!